Excitebike was one of the earliest Famicom games worked on by Nintendo designer Shigeru Miyamoto. 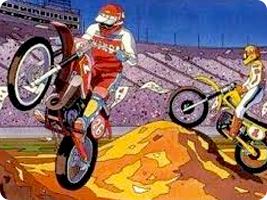 A simple side-scrolling motocross racing game, that has gone on to spawn an unexpectedly long legacy. While the game's key features include huge jumps and stunts, it's the precise controls that are the hallmark of the series.